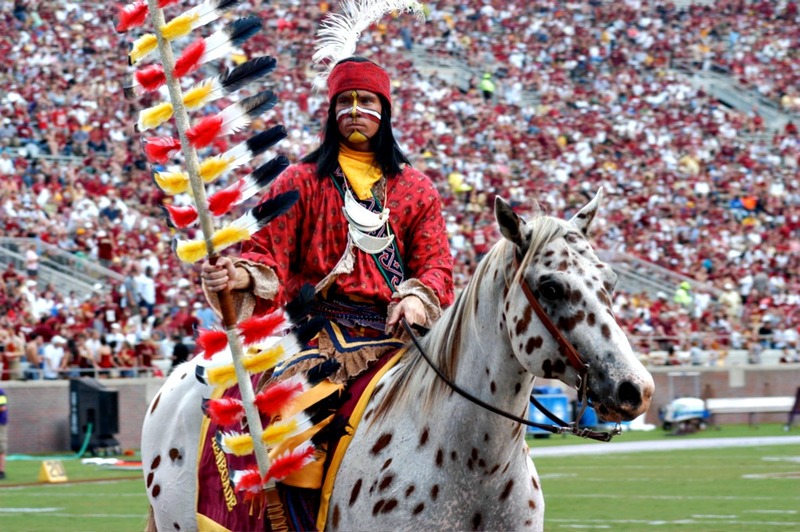 Florida State University (Seminoles) -- and its mascot Chief Osceola and Renegade -- and the NFL's Washington Redskins are among the most prominent examples of Native American mascots. In Massachusetts, an effort is advancing to ban them at high schools statewide. The Algonquin Tomahawks would get the axe if a bill on Beacon Hill advances. The Grafton and Ware Indians would be no more. About 30 or so other public schools in Massachusetts would also have to change their mascots. We say to state legislators: Not so fast. A bill banning American Indian-themed names for school sports teams had a joint hearing last week. The measure should be stopped in its tracks. It’s an overreach, for starters. Mascots are supposed to elicit an element of fun and identity to a school environment. If eventually it seems to be failing to do so, or makes a community uncomfortable or displeased for whatever reason, the community in question should discuss the mascot, vote for a change, and contact the T-shirt makers. Schools, communities and school districts can handle this on their own. Second, this issue is not worthy of the state’s time and debate in comparison with pressing matters directly affecting the classroom. Curricula, accountability, building maintenance, teacher quality, and seriously strained education funding are vastly more important than what a school goes by for a nickname. Lastly, “political correctness” has long taught us lessons about time-wasting due to oversensitivity and contentiousness. We would add that using a mascot in a derogatory sense doesn’t, by and large, happen on purpose. It happens on interpretation. Whatever one’s reaction to Native American-themed names such as “Chieftains,” Warriors” and “Redmen” — and we agree that particularly the latter could be cringe-worthy in today’s taboo atmosphere regarding skin color — it is important to remember that far from derogatory, a mascot almost always is meant to pay homage to an ideal the school feels the mascot represents. Schools choose a mascot out of admiration. Fundamentally, there’s a quality or essential attribute they value, take inspiration from and hope to live up to. We do not ascribe at all to the idea that Native American-themed mascots are inherently and universally controversial. In hearts across Massachusetts, Native Americans occupy a place of wonderment and respect. The rich and complicated history on the topic only deepens the impression of peoples whose powers and trials contributed to who we all are now. In addition to paying tribute, a mascot can embrace the past by literally making it part of its identity. A Native American-themed mascot is often an acknowledgment of people who for years and years lived on, worked, or traversed over a spot long before the school bells rang there. Political correctness also, we all know, has a tendency to run amok. Presidents, Senators, Colonials, Whalers, Millionaires — should we ban them, too? Surely the Westford Academy Grey Ghosts must get busted. That image would spook anyone. Public high schools in Massachusetts bear those and plenty of other names — interesting, ordinary, historical, debatable — for their mascots. A list presented in a WickedLocal story provides them. A link under the list narrows it to 37 nicknames that might have to be changed if the bill, which was filed by a Tewksbury senator and is now in committee, passes. Let schools and communities keep or change their mascots as they wish. There will always be those who would go with a different choice. In the end, of course, the mascot just doesn’t matter. There is plenty, meanwhile, that does, and in Massachusetts — with our long, proud record as a leader in education — we know that.